Judge Daniel Brennan is only days away from achieving a seat on the Second Circuit Court of Appeals bench when he’s brutally stabbed to death in his garage. An army of media and law enforcement descend on the case, and thousands of tips pour in from the public. When one tip leads New Jersey policeman Luke Somers to Steven Gallagher, things quickly go wrong, but Luke is instantly glorified for solving the case.But to one man, Luke is no hero. Chris Gallagher raised his brother, Steven, almost single-handedly, and, certain that Steven is innocent, he won’t rest until he sets the record straight. Thanks to Luke’s newfound fame, he’s an easy man to find, and Chris quickly makes it clear that Luke’s own brother will die if Luke refuses to help clear Steven’s name. So begins Luke’s desperate attempt to find another suspect—any other suspect—in Judge Brennan’s death. 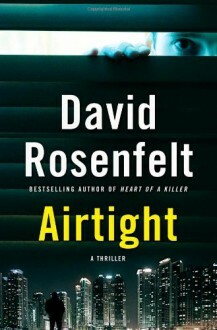 But Luke’s investigation might open the door to powerful forces even more dangerous than Chris Gallagher.From David Rosenfelt, author of the beloved Andy Carpenter series, comes Airtight, a high-octane thriller of murder, revenge, and family loyalty.